Eutelsat launches Europe's first Ultra HD 4K TV channel | What Hi-Fi? The Ultra HD 4K TV bandwagon is starting to gather serious pace in 2014, with a whole host of manufacturers bringing the new format to their line-ups for this year. 4K content, however, has proved a little more difficult to come by so far. That's where France-based Eutelsat Communications is looking to step in. Eutelsat has announced the launch of Europe's first Ultra HD 4K demo channel. It's encoded in High Efficiency Video Coding (HEVC) and broadcasts at 50 frames per second. The channel also boasts 10-bit colour depth – one billion colours – and Eutelsat claims these three features offer a "favourable economic environment" for Ultra HD. 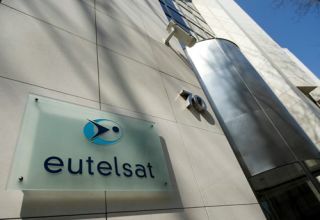 Eutelsat's demo channel is the first that can be received direct by households using "the latest 4K TV panels equipped with DVB-S2 demodulators and HEVC decoders". The signal is free-to-air within Eutelsat's Hot Bird satellite footprint, for those of you who have the means of pointing and/or tuning your dish accordingly. And Eutelsat says TVs including Samsung's 2014 7500 and 8500 Series are among those able to decode HEVC at 50/60fps, with a software upgrade via the internet – an invitiation for which appears when installing the set for the first time. Channel content includes extracts from a performance of Monteverdi's Vespers conducted by Sir John Eliot Gardiner and shot using eight cameras at 50fps. Eutelsat director of marketing, innovation and digital cinema, Michel Chabrol, said the launch of the new channel was a "milestone" in the "commercial roll-out of 4K TV". Chabrol said: "HEVC encoding combined with 50fps are the next step the industry has been waiting for and we are delighted to demonstrate this through our Hot Bird satellites." It seems as if we're now starting to see Ultra HD 4K content catch up with the technology, with Netflix's 4K streaming service now live in the UK with House of Cards season two. And the forthcoming World Cup in Brazil promises to be an exciting test ground for the broadcast of live football in Ultra HD, with more 4K content-related announcements hopefully set to follow.